Iceland is a parliamentary representative democratic republic which means the whole country votes for some old guys and girls to sit in a room and decide things for us. This room is called Alþingi. There are 6 different constituencies in Iceland each one having 9-12 representatives. Those are areas which choose their own old guys and girls to sit in the room and decide things. The head of government is the Prime Minister. 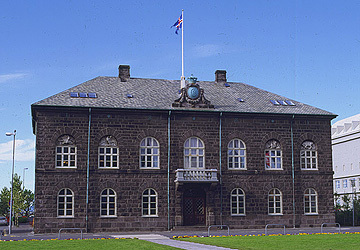 Iceland is a member of numerous international organizations. EFTA, UN, and all that. But the controversial ones are the ones that matter right now. First of all we are a member of NATO, the North Atlantic Treaty Organization, and there has been controversy around the organization since it was established. Usually the right-leaning parties are all for membership of NATO to protect Iceland, but the left-leaning parties do not want anything to do with it, since it is all about war. There has been a huge controversy built around the EU. Now the right-lenaing parties, which make up the government now, don’t want membership, since they think joining the EU will hurt Iceland’s agriculture and fishing industry, and the fishing industry has been the largest industry for a long time in Iceland. The left parties want to join the EU because they think it will balance Iceland’s economy to pick up a new currency, the Euro. The Althing was founded in 930 and is considered one of the oldest extant parliamentary institutions in the world. The Althing was abolished in 1800 but resurrected by the Danish king in 1845. Iceland was made to accept monarchy of both the King of Norway and, later, the Danish King up until 1944, though political ties to the Kingdom of Denmark were hardly any from 1918-1944, when Sveinn Björnsson became president and Iceland was made into the democratic republic it is today. In 2008, many developed economies crashed in to recession and Iceland was one of them. The recession hitting Iceland was one of the worst crises ever to hit Iceland. Even though many events and executions paved the way for the recession, the main causes are believed to be the privatization of Icelandic banks and large industrial projects.The worst consequences of the recession are believed to be the fall of our currency, the Króna, the rise of debts for families and the crash of Icelandic banks. The recession also had considerable consequences for Britain and Holland, because of Icelandic investor’s activities internationally. This caused a huge feud called Icesave, ending in negotiations that ended in favour of Iceland. Iceland has an aforementioned multi-party system, but this system has often be called ‘the four-party system’ by skeptics, hinting at how the result of many elections often ends in only four parties having the majority of the votes, with one or two small parties reaching the parliamentary with as little as 1-3 representatives. The current four largest parties are The Progressive Party, The Independence Party, The Social Democratic Alliance and The Left-Green Movement. Alongside those four parties there are two smaller parties sitting in the Althing, Bright Future and The Pirate Party. Critical voices often call the multi-party system in Iceland the ‘four-party system’, because of four parties that usually sit in the Althing. The Progressive pa rty as a middle-right agrarian party, currently putting emphasis on helping homes in debt and ending all association with the European Economic Community . The Independence party is the only established right-wing party in Iceland and serves as Iceland’s equivalent of a conservative party, their emphasis is mainly on lowering taxes and recently they have begun to put an emphasis on severing all ties to the European Economic Community. The Social Democratic Alliance is a liberal left party; their emphasis is now on continuing negotiations with, and even joining the European Economic Community and bettering transports. The Left-Green movement is the complete left-wing party in Iceland, and the youngest of the largest parties, their emphasis is all green; raising taxes and protecting the environment. Sigmundur Davíð Gunnlaugsson, the leader of the Progressive party, was granted a permission to form the Icelandic government for the next four years. The government is made only of members of the Independence party and the Progressive party. Right now there are six parties in the Althing, with the right leaning parties making the majority and the government. The left leaning parties make up the rest except for the Pirate party, which has three seats. The present government has already put in legislatures to remove the natural resource taxes made for fishing companies and their hope for future executions revolves around correcting debts and lowering taxes.